Businesses are often wary of change. It creates uncertainty and development projects get stalled. Instead of seeing change as an opportunity, business leaders start to plan for worse case scenarios that may result from the change. The businesses adversely affected are normally large organisations with a vested interest in the status quo, however for smaller more flexible businesses and certainly start-ups, these market changes can be a fantastic opportunity to grow. There is always change, in reality nothing stays still, as the bones of once giant corporations will testify. 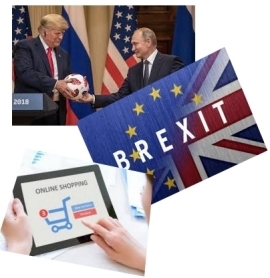 In the past many have been caught out by technological or fashion trends, but now we also have global changes such as Brexit, migration and the fall out of Mr. Trump’s policies that will add to the melee. So how do we go about spotting those changes that are likely to produce great opportunities? Basic technique – Using colleagues, or friends (5 to 12 is ideal, but if you are a one man start-up finding even just a couple of friends to help will get you going), jot down thoughts on a flipchart or post-it pad, no idea is initially too crazy and no one should be dominant. However give it structure (see below), address a specific question and having a team leader will facilitate the process. You will see that we are identifying changes and then delving deeper into the impact of change to discover opportunities that we can address. 2. You can also look at recent entries to your market, are these businesses addressing new opportunities that have arisen from change that you can expand on, or that may inspire you to think of similar opportunities. 3. Another way is to think about those established companies that are going through tough times – why – what is taking their custom? In all of the identified changes, think about the basic strengths of your own business (or yourself if an entrepreneur looking for a potential business). What is your core knowledge / expertise? How can that be applied to creating an opportunity from the changes? In every change there are going to be people that spot the opportunities and make a lot of money, think of when financial regulation of the stock market changed in London and the fortunes that were made, or how Russian entrepreneurs embraced new market conditions after communism fell. You can be one of the people that do very well out of the changes happening today, but only if you take the time to spot the opportunities and then most importantly – act on it. « What should you do before leaving your corporate job and starting a business?